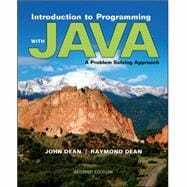 Introduction to Programming with Java: A Problem Solving Approach teaches the reader how to write programs using Java. It does so with a unique approach that combines fundamentals first with objects early. The book transitions smoothly through a carefully selected set of procedural programming fundamentals to object-oriented fundamentals. During this early transition and beyond, the book emphasizes problem solving. For example, Chapter 2 is devoted to algorithm development, Chapter 8 is devoted to program design, and problem-solving sections appear throughout the book. The second edition adds new language features and end-of-chapter GUI sections that include animation. New chapters include an introduction to the Java Collections Framework and an in-depth treatment of recursion. Two new supplementary chapters on the book’s companion website describe the JavaFX GUI platform. •	A conversational, easy-to-follow writing style. •	Simple GUI programming early, in an optional standalone graphics track. •	Well-identified alternatives for altering the book's sequence to fit individual needs. •	Well-developed projects in six different academic disciplines, with a handy summary. •	Detailed customizable PowerPointTM lecture slides, with icon-keyed hidden notes. I have used the Dean and Dean book in my Introduction to Java Programming class for the past year. This is an excellent text and I am very happy with it. It is the only text that I have ever used that always gets positive comments from students on my class evaluations even though there is no question asked about the text. The chapters are well thought out and the coverage is complete. The progression from topic-to-topic is masterful, and the writing is exceptionally clear and at the perfect level for an introductory Java class.